Marrakech is not bad for a night out, I'm reliably told. So I'm sure Real Madrid's players and staff will find a half-decent bar to have a good old knees up later. And you can't argue that they don't deserve it. Los Blancos, who now enjoy a two-week break as the Spanish league takes a breather, have finished a marvellous 2014 in style. Four trophies won, plenty of goals scored, several records broken. Even the most ardent Barcelona fan would have to say that deserves a thumbs-up. We'll back for another European-flavoured live text commentary tomorrow as Spanish champions Atletico Madrid travel to Athletic Bilbao (20:00 GMT). Adios amigos! Opta Jose: Real Madrid have scored 178 goals in 2014 (all comps), more than any other La Liga side within a calendar year. Nope, no breakthrough for Roma - but Gervinho goes mighty close. The Ivorian is denied by the feet of Diego Lopez in added time and it ends goalless at the Stadio Olimpico. Roma head into the winter break three points behind league-leaders Juventus after failing to break down the ten-men of AC Milan. While the Real Madrid players and staff celebrate their latest success on the pitch in Marrakech, there is less fun on the pitch in Roma. It is a war of attrition as second-placed Roma go hell for leather in search of a late winner. Arsenal's former Real Madrid midfielder Mesut Ozil: Congrats to Real Madrid! barbuwa kalla: ‏Another win for Real Madrid to make it 22 on the bounce. Another trophy in the cabinet and currently leading in La Liga. And it was business as usual for Madrid. The routine win over South American champions was their 22nd straight victory. And it clinched their fourth piece of gleaming silverware in 2014. Real Madrid boss Carlo Ancelotti turns to right to, rather formally, shake hands with club legend Fernando Hierro as the final whistle goes. It's only business. REAL MADRID ARE WORLD CLUB CHAMPIONS! As if this result was ever in doubt. 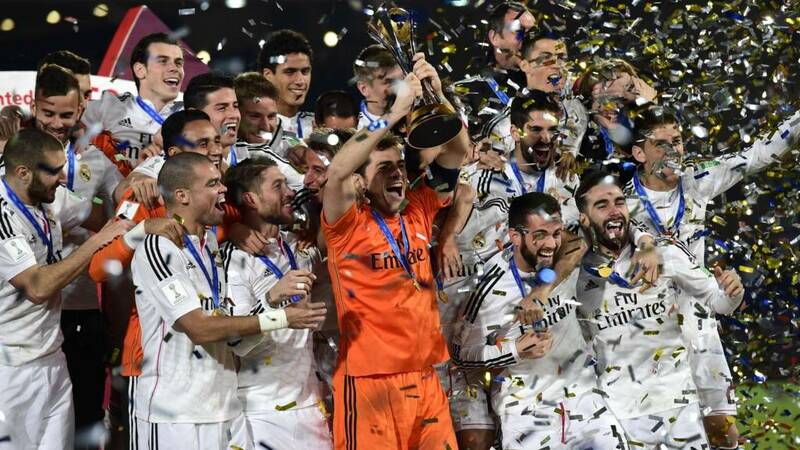 The referee blows his whistle for the final time and that means Real Madrid have won the the Club World Cup! Two minutes of stoppage time. Two minutes of stoppage time until Real Madrid are crowned the world club champions. It's still goalless in Rome midway through the second half. But Milan are down to 10 men after defender Pablo Armero was booked for a deliberate handball - his second yellow card of the game. Roma have brought on top scorer Adem Ljajic to replace Alessandro Florenzi. Home skipper Juan Mercier has got the bit between his teeth now. After that earlier moments ago, he drives forward again and fancies his chances from about 20 yards. This time he doesn't trouble Iker Casillas and the ball skids wide. Credit to San Lorenzo though. They are a limited bunch - that's not meant to sound condescending, but they are a million miles away from Madrid - but they have put a real shift in to stop the European champions scoring more. Karim Benzema looks keen to grab himself a slice of the goalscoring pie tonight. He peels off to the left flank again, driving at the full-back, but can't find a white shirt with his cross. Now Madrid go forward. Karim Benzema sticks on the burners down the left, with Cristiano Ronaldo tagging along for the ride. But the Frenchman cannot pick out his pal and San Lorenzo scramble clear. All pretty low-key over the last few minutes. Real are content to keep possession, knocking the ball around at a leisure pace, without really looking that interested in digging out a killer pass forward. Madrid make their second substitution of the night - and again it is a change at the back. Right-back Dani Carvajal, who is on a yellow card, trudges off for Alvaro Arbeloa. Another chance at the other end as Madrid threaten to bag a third. Gareth Bale swings in a cross from the right and Karim Benzema diverts it past the wrong side of the post. To be fair to San Lorenzo, they do manage to push and probe for an opening inside the Madrid half. However, they can't find that cute, killer pass to break Sergio Ramos and company into a cold sweat. The size of the gulf between these sides is probably best illustrated by the fact that San Lorenzo only have one World Cup player in their ranks - and that is veteran Colombia defender Mario Yepes. Twenty minutes to go. Any chance of a miraculous San Lorenzo fightback? No. Freshen up, freshen up. That's the message from the San Lorenzo bench as forward Mauro Matos eagerly runs on to replace Martín Cauteruccio. Meanwhile, the Madrid bench sit back with their feet up and cigars in their mouths. Sofia Bruenner: We are yet to mention Ronaldo in the game. Stay tuned. Is this Iker Casillas's first meaningful save? I think it is you know. The Spain veteran finally gets his sharp, white gloves dirty as he tumbles low to his left to gather Emmanuel Mas's shot from a tight angle on the left. Madrid boss Carlo Ancelotti might have to send out a search party soon - has anyone seen Cristiano Ronaldo? The record-breaking superstar is nowhere in sight. Maybe he's preening in the changing room mirror. Madrid could fill their Christmas stockings with plenty of goals if they really want to. Perhaps they are feeling rather generous and sparing their Argentine opponents in the season of goodwill. Then, France striker Karim Benzema goes close with a dipping half-volley which flashes past the right-hand post. Milan have survived a penalty appeal - when Nigel de Jong slapped a cross away from Gervinho's head - and somewhat weathered the storm at the Stadio Olimpico. Filippo Inzaghi's side could even have taken the lead in spectacular fashion before the break when a Philippe Mexes strike from ten yards inside the Roma half forced ex-Real Madrid stopper Diego Lopez into an athletic save. Kento: What's the name of the San Lorenzo GK? Santa Claus? Awful goalkeeping allows Bale to score the second goal for Real Madrid. Gareth Bale fancies another goal now. The Welshman is at the heart of another Madrid attack, bursting forward in a central position, only to be hacked down by Julio Buffarini. The San Lorenzo man doesn't win the ball, but he does earn himself a yellow card. The Pope might be San Lorenzo's most famous fan, but I don't even think his prayers will help the Argentine side now. However, they do produce their best effort, moments after Gareth Bale's goal, as Enzo Kalinski's sharp volley flies over the Madrid goal. This is not going to go down as Gareth Bale's finest goal - but he doesn't care. Neither does Madrid boss Carlo Ancelotti, who raises both clenched fists in the warm Moroccan air. The Welshman is allowed the time to turn just inside the San Lorenzo box, collecting Isco's pass before tamely shooting towards goal. But San Lorenzo keeper Sebastian Torrico can only fumble, rather pathetically, into his own net. San Lorenze, who are the South American champions remember, almost needed binoculars to grab a glimpse of the Madrid goal in a one-sided first half. But they must have been given a half-time rocket - because they're straight up on the attack. Pablo Barrientos swings in an early corner before veteran defender Mario Yepes fails to hit the target. The referee toots his whistle and that, unless I'm sadly mistaken, means we are back under way. 100% - Toni Kroos has completed all of his 44 passes in the first half of the final against San Lorenzo. And after the final whistle against Cordoba, it was time for the Barca boys to crack open the bubbly. Club president Josep Maria Bartomeu went down to the dressing room to toast his players and coaches ahead of the Christmas break, with Luis Enrique, Xavi, Andres Iniesta, Lionel Messi and Sergio Busquets happy to raise a glass. And, after a trophyless 2014, I'm sure Bartomeu's Christmas speech also included a gentle reminder that he wants to see silverware in 2015. While La Liga leaders Madrid are sunning themselves on this jolly in Marrakech (and hardly breaking sweat while they're at it), the rest of the Spanish top-flight are trying to catch them. a thumping 5-0 home win against Cordoba. Spain forward Pedro blasted in after 72 seconds, before Luis Suarez poked in his first La Liga goal shortly after half-time. Gerard Pique's header and a brace from Lionel Messi clinched an easy win. Madrid goalscorer Sergio Ramos sticks a reassuring arm around his goalkeeper Iker Casillas as they stroll off for a half-time cup of tea. Perhaps Casillas feels a bit lonely seeing as he has been a lonely spectator for most of this match. Perhaps the Real Madrid players should have a half-time cup of mulled wine each - that might help increase the entertainment value after the break. You won't be surprised to learn that San Lorenzo cannot claw themselves back level in an uneventful period of stoppage time. Real Madrid are one half of turgid football away from becoming the world club champions. Two minutes of added time for San Lorenzo to nick an unlikely equaliser before the break. Uh oh. Bad news for Real Madrid and coach Carlo Ancelotti. Brazil left-back Marcelo pulls up with what appears to be a muscle injury (although I'm no physio) and has to be replaced. The good news is that Portugal international Fabio Coentrao is a natural replacement. A few hundred miles north of Morocco, there is an important game in Italy's Serie A between second-placed Roma and fallen giants AC Milan. Milan pair Keisuke Honda and Andrea Poli forced early saves from Roma keeper Morgan De Sanctis but the home side have made most of the running at the Stadio Olimpico, with former Arsenal forward Gervinho particularly threatening. A home win for the Giallorossi would close the gap to league leaders Juventus to just one point heading in to the winter break. Sergio Ramos has scored more goals than any other La Liga defender during 2014 (all comps). barbuwa kalla: Even the Pope won't complain if they lose against this Madrid side. James Benson: Pepe has not had a yellow card in La Liga all season. Incredible stat given his discipline of old. John dunthorne: It seems appropriate that one of the masters of the "dark arts" should be the first goal scorer in this roughhouse. Sergio Ramos might pick up plenty of yellow (and red) cards but he also picks up plenty of goals. And here's another textbook Ramos effort. The Spain centre-back nicks a yard on his marker to rise highest in the San Lorenzo box and meet Toni Kroos's left-wing corner with a thumping header. Advantage Madrid. Normal service resumed. Waves of white shirts edge towards the San Lorenzo goal, but the South American champions's defence scrabbles back to block Isco's shot. Better from San Lorenzo! They manage to stay inside the Madrid for at least a whole minute. First they see the free-kick conceded by Dani Carvajal headed clear before Enzo Kalisnski's run from the left fails to pick out another blue and red shirt. Another Madrid defender is nervously edging along the disciplinary tightrope. The name of right-back Dani Carvajal goes into the referee's notebook after he clumsily swipes at the legs of left-sided San Lorenzo player Emmanuel Mas. Now Sebastian Torrico has his palms warmed by a Madrid shot. The European champions neatly play up to Karim Benzema whose fierce low shot is gathered by the San Lorenzo keeper at the second attempt. Gareth Bale was ready to snap up the scraps like a hungry wolf. Madrid continue to dominate possession, hogging about 72% of the ball so far. But they haven't really tested San Lorenzo keeper Sebastian Torrico yet - he's made just the one routine save. From the evidence of a physical opening quarter, I can't see this ending 11 v 11. And if I was a betting man then I'd suggest Sergio Ramos would be the likeliest Madrid player to see red first. Him or Pepe. But Ramos has a headstart on his defensive colleague after being given a yellow for cynically stopping a San Lorenzo counter attack. Another Madrid free-kick, this time a little deeper, midway inside the San Lorenzo half. Germany midfielder Toni Kroos clips in an inswinging delivery which the brutish Argentine defence head clear. Every time San Lorenzo have the ball, it is like they are almost forced to give it back to the playground bully that is Madrid. Momentarily they have possession, but lack numbers in attack and surrender the ball quickly. Cristiano Ronaldo is licking his lips once again as he takes control of the set-piece situation. But once again he can't clear the San Lorenzo wall. Combative would be one way to describe San Lorenzo in these early stages. Downright dirty might be another. This time Gareth Bale is chopped down about 25 yards from goal by that old Colombian warhorse Mario Yepes. How old is he now?? San Lorenzo are backed by an army of 5,000 travelling fans, who are excitedly bouncing about in the stands. Clearly they are here for the big day out rather than the expectation of success. Finally San Lorenzo have a few confidence-boosting touches of the ball, neatly stringing together a few passes before a forward ball is sent towards Uruguayan forward Martin Cauteruccio. But he is muscled off the ball by Madrid centre-back Pepe, who earns his side a goal-kick. Will Jackson: The Pope supports San Lorenzo... You never know? Stuart Mitchell: Very long night in store for San Lorenzo, especially if they are intent on fouling so often yellows and reds to come soon. I'm not sure what the possession statistics are, but I'd hazard a guess that they are well over 70% in favour of Madrid. The men in that famous all-white are like a dog with a bone at the moment, refusing to let go of the ball. Cristiano Ronaldo huffs and puffs, standing with his arms outstretched, sizing up his options. In typical fashion he drills the ball towards the San Lorenzo goal, but a deflection takes the sting out of the effort and into the grateful hands of keeper Sebastian Torrico. And Madrid should be ahead inside the opening minute! Toni Kroos pounches on a loose pass, drives forward with the speed and efficiency of a German motor, before feeding Cristiano Ronaldo. The Portugal superstar drives a low cross across the goal, but Karim Benzema - who seems to get his boot stuck in the turf - cannot connect. The stage is set. Game on in Marrakech. San Lorenzo are undeterred by the big gulf that separates them from Real Madrid - and are taking inspiration from ex-Argentina captain, and current Atletico Madrid coach, Diego Simeone. "We'll have to fight for each ball as if it were the last," says San Lorenzo midfielder Leandro Romagnoli. "If we respect them too much it will be impossible. "If we give them any freedom they will hurt us a lot...we have to play with a knife between our teeth," he added, repeating a phrase often used by Simeone. When Fifa president Sepp Blatter rolls into town, you know it is a big event. Here he is, strolling out on to the Marrakech pitch to wish the players all the best. San Lorenzo are attempting to become the first Argentine side to win the Fifa Club World Cup since the tournament started in its current format in 2005. Boca Juniors and Estudiantes have previously reached the final, losing to AC Milan and Barcelona respectively. That record is a stark contrast to the old Intercontinental Cup, played by the European and South American champions, which Argentine sides won a record nine times. Right then, we don't want to do all the work tonight. We need some help from you lot. So don't be scared to tell us your thoughts. How many goals are Real Madrid going to win by? Or can San Lorenzo cause a shock? And, to perhaps give San Lorenzo some inspiration, why don't you tell us your favourite footballing shocks. You know what to do. Tweet using #bbceurofooty or text 81111. Cristiano Ronaldo scored 17 goals last season in the Champions League, one more than all of San Lorenzo in the Libertadores 2013-14. Does this man look familiar? Probably not to most of you. But maybe to those Manchester United fans with a sharp eye and a long memory. This is San Lorenzo coach Edgardo Bauza, who some may remember led Ecuador's Liga de Quito in the 2008 final against Manchester United. they lost 1-0 - and even fewer are backing him to mastermind a shock against Madrid. "I believe 100% in our chances," said coach Edgardo Bauza. "You have to dream of winning." AS English: Dida and Thiago won the Club World Cup with two different sides: Cristiano Ronaldo and Toni Kroos have the chance to join that elite group tonight. If you doubted how seriously Madrid are taking this competition then just have a glance at that team-sheet. Cristiano Ronaldo? Check. Gareth Bale? Check. James Rodriguez? Check. While Madrid could afford to splash out 80m euros on Colombia star Rodriguez in the summer, San Lorenzo spent a paltry 3m euros in the entire transfer window. The princes v the paupers. Real Madrid: Casillas, Carvajal, Pepe, Sergio Ramos, Marcelo, Ronaldo, Kroos, Rodriguez, Bale, Isco, Benzema. Subs: Navas, Varane, Fabio Coentrao, Khedira, Hernandez, Arbeloa, Nacho, Jese, Illarramendi, Medran, Pacheco. San Lorenzo: Torrico, Yepes, Mas, Kannemann, Mercier, Buffarini, Kalinski, Barrientos, Ortigoza, Cauteruccio Rodriguez, Veron. Subs: Franco, Cetto, Romagnoli, Arias, Villalba, Blandi, Cavallaro, Matos, Catalan, Fontanini, Quignon, Devecchi. Tonight, Madrid are aiming to end a productive 2014 with a fourth trophy. In many eyes, the Club World Cup might not be as prestigious as La Liga, the Champions League, or the Copa Del Rey, but don't you dare suggest that to Madrid coach Carlo Ancelotti. "We're ready and we're out to finish the year on a high," says the Italian. "It's a final and we're in good shape. We have to have confidence that something positive will happen in the final." Carlo Ancelotti won't be looking that glum later on this evening if European kings Real Madrid end up on top of the world. That's right, the Spanish giants will be crowned the best club side on the planet if they manage to beat South Americans champions San Lorenzo in the Club World Cup final. Twelve months ago, no-one had ventured into Madrid's trophy cabinet for a while. Now the 'silverware señor' is a busy man once again, digging out his polish and duster with increasing regularity.